I'm slightly embarrassed to admit that this post has been sitting in my drafts folder since December... back when I set my blogging goals for the new year. One of those goals, you may recall, is to be more intentional about contributing to the teaching blog community. I want to have more focus in my writing, which is easier now that I have my own classroom again, and I want to make sure I'm sharing ideas instead of just taking from others. 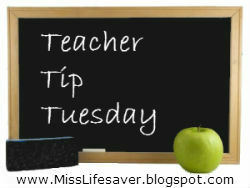 To that end, I'm starting a new series, I'm calling Teacher Tip Tuesdays. My goal is to share at least one great teaching idea with you each week. I promise not to tantalize you with great ideas just to send you over to TPT to buy my products... that's not my purpose. (In fact, at this time, all of my TPT items are FREE!) I just want to share what's worked for me in hopes that it might work for someone else. If you have a great Teaching Tip that you'd like to have featured on my series, I'd love to hear from you! My contact information is available in the About Me tab. I started a new tab, Teaching Tips, where you can find links to my favorite archived tips. I've already archived several of my old posts for your reading pleasure. Be sure to check back each week for new ideas! Great idea! I'm really looking forward to future Teacher Tip Tuesdays!